For the New York City social group, see Trap Door Spiders. 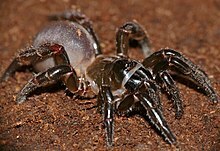 For other spiders called "trapdoor spiders", see List of trapdoor spiders. Ctenizidae is a small family of medium-sized[example needed] mygalomorph spiders that construct burrows with a cork-like trapdoor made of soil, vegetation and silk. They may be called trapdoor spiders, as are similar species, such as those of the families Liphistiidae, Barychelidae, Cyrtaucheniidae and some species in Idiopidae and Nemesiidae. In 2018, the family Halonoproctidae was split off from Ctenizidae, leaving only three genera. The name derives from Greek κτενὶζειν ktenizein, meaning "combing" or "cleaning", referring to their behaviour of cleaning continuously, and the suffix -idae, which designates belonging to a family. Trapdoor spider burrow opened to show inside of lid with its ring of punctures where the spider had gripped. The trapdoor is difficult to see when it is closed because the plant and soil materials effectively camouflage it. The trapdoor is hinged on one side with silk. The spiders, which are usually nocturnal, typically wait for prey while holding on to the underside of the door with the claws on their tarsi. Prey is captured when insects, other arthropods, or small vertebrates disturb the 'trip' lines the spider lays out around its trapdoor, alerting the spider to a meal within reach. The spider detects the prey by vibrations and, when it comes close enough, leaps out of its burrow to make the capture. A hungry individual will wait halfway outside its burrow for a meal. Male trapdoor spiders can overcome the female's aggressive reactions to their approach, but it is not known how. Females never travel far from their burrows, especially if they have an egg sac. During this time, the female will capture food and regurgitate it to feed her spiderlings. Enemies of the trapdoor spider include certain pompilids (spider wasps), which seek out the burrows and manage to gain entrance. They sting the owner and lay their eggs (usually one per spider) on its body. When the egg hatches, the larva devours the spider alive. Unlike other mygalomorph spiders, the Ctenizidae have a rastellum on the chelicera. Resembling "teeth" or "barbs" on each fang, this modification is used to dig and gather soil while constructing a burrow. They use their pedipalps and first legs to hold the trapdoor closed when disturbed. There are about 50 species of Ctenizidae. The Spider Wasps of the subfamily Ctenocerinae found in the Neotropics, Africa and Australia are specialised hunters of trapdoor spiders. Genera of Ctenizidae are found in Europe, Asia and South Africa. They may be more common than thought because of their cryptic habits. They do tend to be localized in distribution and as such may be subject to extinction because of local habitat destruction. Most species live in burrows rather than webs. They make silk hinged doors that blend with their habitat. Not all members of the family use trapdoors. ^ a b Eskov, K. Y.; Zonstein, S. L. (2000). "The First Ctenizoid Mygalomorph Spiders from Eocene Baltic Amber (Araneida: Mygalomorphae: Ctenizidae)". Paleontological Journal. 34 (suppl. 3): S268–S274. Part 1; Part 2 (PDF). Raven, R.J. 1985 The spider Infraorder Mygalomorphae (Araneae): cladistics and systematics. Bulletin of the American Museum of Natural History 182: 1-180. Wikimedia Commons has media related to Ctenizidae. This page was last edited on 25 April 2019, at 16:42 (UTC).